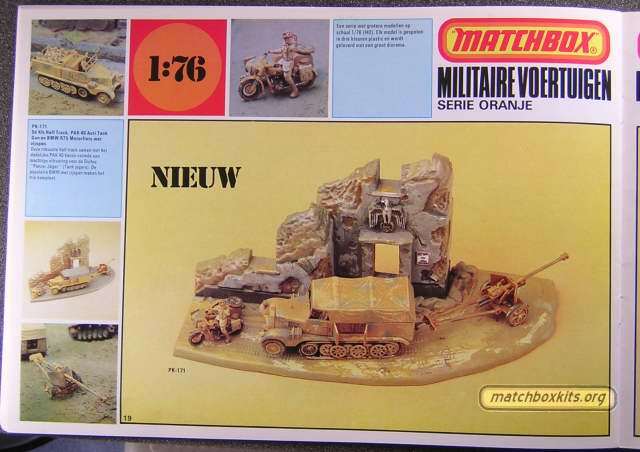 The 1978 catalog on page 19 shows a German half trach and diorama. On the wall is a poster with the words" DIZ VAR YOU VIL VIN". I worked at matchbox from 1976 - 1983 and I constructed and painted that kit. I had no idea that the model was for a photo shoot. When the catalog was printed my poster and words were discovered I was dragged over the coals first by Jim Peck, who was the "foreman" of the model shop then by Nick Austin, and Gerry 'Decarian' MD and head of kits marketing. I was very nearly fired and told that 30,000 catalogs had to be destroyed. In that meeting I was also told that Nick Austin was to appear on tv later that week to apologise for the indescretion. I soon found out however that his tv appearance was to debate the use of iron crosses and other insignia on German military vehicles. I managed to hang onto a catalog and had thought for 30 odd years that it is unique. Please don't tell me that for all that time I had been subject to a prank.